I knew I wanted to read this book as soon as I saw that it mentioned Da Vinci. Don’t judge but I have had a minor obsession with that guy since I read Dan Brown’s The Da Vinci Code. I know that novel isn’t historically accurate, and that its fiction, but it started my interest in the inventor and artist. 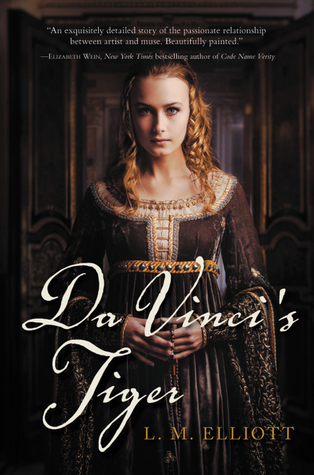 Da Vinci’s Tiger took a more historically accurate route to get to know this famous historical figure and, if I’m honest, I kind of wished it had been a little more fantastical. My biggest issue with this novel was that it was slow. I think this is my issue with most historically set novels. For some reason when authors write historical fiction, especially in the YA genre, they feel they have to focus on the research they did to build the world. I love good world building but if you keep harping on what the pigeons are doing in ancient Florence I just don’t care. That was this books problem it was historically accurate to a fault. The characters in this novel were subdued. They didn’t fly off the page and demand to be heard. They were a slow burn which I can appreciate, unfortunately this book was short. At 304 pages your characters have to fly off the page to make me notice them. There just isn’t the space for a slow burn. I did find Ginevra to be a nice narrator. The relationship between her, her husband, and the Venetian ambassador Bernardo Bembo was rather strange. This novel dealt with the concept of Platonic muses, which is something I wasn’t familiar with and I think there is a lot more about that history that the author chose not to include. I will mention again that this novel is well researched. It blends art, history, and fiction seamlessly. Still, I think authors have a tendency to write the past as bland and I felt that way with this book. There just wasn’t anything that made me go “wow”. Overall, this was a slow but historically accurate novel. There was nothing technically wrong with it just let me feeling meh. If you have a love of historical fiction, or Florence, Italy I would definitely give this try.